Why use a Refuge Cage? All squirrels are vulnerable to cold and wet weather and they may not survive if held captive for a long period or overnight in an open cage trap. It is particularly important to cover cage traps set on the ground because a captured animal or bird is also vulnerable to attacks from foxes, badgers, crows, cats and dogs. A covered Elgeeco Refuge Cage attached below the floor door of an Elgeeco squirrel trap provides a darkened weatherproof compartment into which a captured squirrel can retreat if it wishes. Although an Elgeeco trap is up off the ground away from predators, the use of the optional Refuge Cage may be recommended when traps cannot be checked frequently during periods of bad weather or immediately before nightfall. In areas where red squirrels might be present, always provide nesting material and check traps frequently. 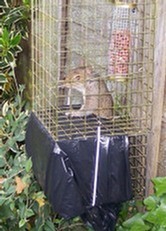 IThe Refuge Cage entrance incorporates a spring loaded self closing door which can be locked shut with the Grey squirrel safely inside the cage before removing it from the trap. Detailed instructions are included. It is illegal to release or allow a captured grey squirrel to escape back into the wild. It is illegal to possess and transport a live grey squirrel without a licence. Live captured grey squirrels must be dispatched in a quick and humane manner. If you are not familiar with the legal methods by which grey squirrels may be dispatched, you are advised to seek professional advice or employ another competent person to carry this out.